It’s Building STEPS’ inaugural blog post. We are joining the internet community to share our perspective on all things education. Building STEPS is a unique model of progressive programming with the singular purpose of ensuring our bright, Baltimore city students who attend some of our more challenged and under-resourced public high schools earn a college degree. It’s that simple. Today, we share a story that puts a smile on our face. We know that it’s more than just receiving good grades. Xiang is the first in his family to attend college, and commutes daily from his home in east Baltimore to attend school. 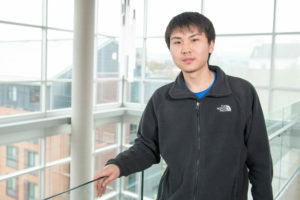 Along with Xiang’s aptitude, it’s his determination to succeed that earned him that scholarship. He might not realize the whole picture today, but we sure are proud of him!